While Nintendo as a company and platform holder naturally has its ups and downs, many agree that its core, big-name games deliver a distinct level of quality and refinement. From the precision platforming in Mario games to the structure and design of Zelda titles, to recent examples such as Splatoon re-shaping how we play and control competitive shooters, there's a notable Nintendo style that often shines through. Kotaku has now published an interesting interview that took place during E3, in which its editor Stephen Totilo sat down with Shigeru Miyamoto and Bill Trinen to primarily talk about The Legend of Zelda: Breath of the Wild. The topic pivots, somewhat, to more general principles of game development, which is also appropriate considering the manner in which the new Zelda title impressed media and audiences during the June event. That game's unveiling seemed to be a reminder, if we needed it, that the big N's star development teams still demonstrate extraordinary skill and creativity when the opportunity arises. The interview addresses a number of topics; we've picked out an exchange about controls and the 'feel' of Nintendo games. Kotaku: When I'm thinking about what sets a Nintendo game apart, often it's the feel of it. It's the controls. It's how Mario jumps in Super Mario 64, which just feels so good. I can't explain in words why that is. And I feel that in the better Nintendo games. I assume you feel it, too. How important are controls, and how hard is it to get them to feel as good as they feel? Miyamoto: So you know programming is all about numbers. The challenge is getting this kind of feeling into numbers. So there's a lot of back and forth between the programmer and myself and the director. We really go in deep about how to create this feeling. We do a lot of back and forth. Trinen: ...which if you were to translate directly sort of means 'hand response.' There's also hagotae, which is the sense that you get on your teeth when you're eating food. Tegotae is the word that you're describing when you talk about that feel of a Nintendo game and it goes back to the focus on the notion of pressing a button and what happens on screen and how do you feel. Miyamoto: So the next one is weight. It's really important to make the player feel as if they are there. There are many different ways to create the idea of weight. So, for example, if someone jumps from a high place, how long that character stays there. I think the other thing is response. If we really wanted to make something look pretty, we would just have [the] animator create it and you would just replay it. But there's no sense of control there. If a character is in front of a wall and they start moving like they're not in front of a wall, it creates that disconnect. And it becomes unnatural. So it's really about taking what the animator does and polishing it up and making it so it's interactive. The full interview is most definitely worth a read, addressing a number of areas that reflect Miyamoto-san's principles and ideas for managing and creating high quality games. 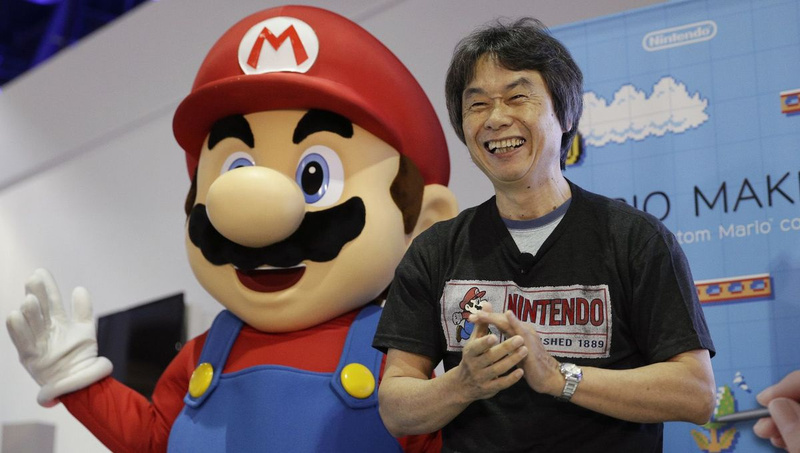 Shigeru Miyamoto also remarks at one point that he doesn't feel that he's 'gotten old' - we certainly hope he'll be leading and guiding development teams for years to come. When it comes to response, controls, feeling of weight, all that jazz, Nintendo is second to none. I still think the feeling of weight DK has in DKC Tropical Freeze is approaching perfection. I consider kotaku antinintendo!! I don't visit that site anymore! I also go by a system I coined, maybe it has an equivalent, but the idea that the background music, sound effects and all those audio elements should reflect what you are doing and seeing. Like some tracks just sound better in a 3D space than 2D, ya know? Hard to explain, but these are solid design principles I try to hold onto, but given they aren't being taught or upheld in my course or by my peers, I have a feeling the wider industry doesn't worry too much about quality and how a game feels to play and experience. "Shigeru Miyamoto also remarks at one point that he doesn't feel that he's 'gotten old' - we certainly hope he'll be leading and guiding development teams for years to come." In before people comment about Sticker Star and Star Fox Zero, etc. etc., and how Miyamoto is too old and the detriment of Nintendo and needs to retire, yadda-yadda-yadda. @cheleuitte This question is purely out of curiosity; I am not denying your comment. Why is it you say that? They seem to do a good job of including articles from every developer. Sorry if my ignorance is bothersome. That's funny considering Star Fox Zero. I hope Zelda BotW doesn't have a "remastered" story like StarFox Zero. @LUIGITORNADO Jesus Chirst you guys. SFZ is not that bad as you people are making it out to be. Geez you people act like it's the worst game ever made. I will NEVER argue the tightness to Mario controls. I WILL argue, however, that Mario is becoming a two dimensional character(no pun intended), as far as running, jumping, and saving Peach. Hopefully, they will join the times with Mario like they've done Link. @liljmoore I'm assuming most haven't played it and are just jumping on the hate train. @faint To tell the truth. I really don't know. For meSFZ is the first SF game I've played and its controls don't feel bad for me and it has kept me more interested in the gameplay then the 3ds SF game. @FlameRunnerFast Hey, I never said the Miyamoto complaints were unjustified. development team turn him down about? I don't think I'm familiar with that one. @Not_Soos They had heated discussions about who the main characters were gonna be. Mario or the Squids. That's the only thing I heard about it. Metroid Fusion. It's exactly the kind of game immersive enough to make you FEEL like you're part of that world, because of the physics, by absorbing parasites, by testing how your abilities and the enviroment behave. The water, gravity, the hanging grips, the narrow passages, hot areas, cold areas, every little detail adds so much depth that you feel like that little space station has something special. @LUIGITORNADO What exactly is funny? That game's only sin is being really short. Gameplay-wise it's very immersive and rewarding once you learn the controls. @PlutoPerson I said that because two years ago they just used to say bad things about nintendo with no fundament at all, maybe they changed people in their staff but I don't care anymore!! Throw some respect on the man's name, ppl. @MrPuzzlez And how exactly does Mario "join the times"? Platformers are rarely seen in the market outside of Nintendo, and the ones that do are mainly just riding Mario's coattails. So how does Mario follow the rest of the industry when there's no "modern" platformer for them to base it on? It blows my mind how nintendo fans think miyamoto deserves all the credit. I feel bad for the game devs at nintendo who do a great job, but are forced to stay faceless in a cubicle. Excuse me, this is extremely important. @goonow it doesn't all have to be about the ego, you know. Some people will even tell you things are better when the ego is told to stfu. I've been trying to explain to my PC owning friend about the 'feel' of Nintendo's controls, and how it's influenced other Japanese games like Street Fighter, Bayonetta, and the Warriors games that Western games like Assassin's Creed, Mortal Kombat, Rayman, and Doom lack. It's the responsiveness; it's the gravity physics, it's the timing of the sound fx. When you've grown up with it, games that lack it feel cheap and sloppy without it. One of the best things you can learn for designing experiences is what it means to press a button. Nintendo knows this. While yes there are countless examples of classic Nintendo games, Star Fox Zero immediately came to mind as being the antithesis of this article and that's just from the first paragraph. And for those upset by it, it is one of Nintendo's most recent games with Miyamoto at the helm of the ship, crashing it upon the proverbial rocks. Great comment. I love the feel of Nintendo games. It's the extra fine details that Nintendo focus on and many other things that make Nintendo games special. Shigeru Miyamoto is an amazing human being. Miyamoto is right the controls can define a Nintendo game, but NOT the controller. We knew in the first year that the Gamepad should have been shelved, and more effort should have been put into the game rather than the controller. An example is Starfox. We now know it was not the graphics that delayed the games release, it was the controls. In the end we were offered a less than complete game. An example of how Nintendo got it wrong. The feel of the controls is one thing Nintendo consistently does very well—except when it's adding in gimmicky stuff like it did in Star Fox Zero and games like that. But, usually it's spot on with the controls, as well as the gameplay it builds around those core controls. @zool I don't think the GamePad's problem was itself, other than a few elements that maybe could have been tweaked slightly (like the battery life, extending it's wireless reach, maybe adding analog to the triggers, possibly allowing us to use more than one at time, and a couple other things like that), but more the lack of truly compelling games and experiences that really showed us why it was worthy of existing (until later on in the Wii U's life). If Nintendo had released more games like Super Mario Maker and Art Academy: Atelier in the first year of the system's life, and just done a bit more to build experiences around its unique features in general, I think things could have been very different. Also, stuff like amiibo really should have been available out-the-gate too. Nintendo just really dropped the ball with the Wii U at launch as well as during the year head start that it had over the competition too, where it really could have established a commanding lead but totally and utterly squandered the opportunity. I actually can't believe just how much stuff Nintendo did wrong with the Wii U when I look back on it; it basically gave it almost every single possible chance to fail—and it did. "Tegotae, or the 'feel' of controls, is just one example"
Yeah, Miyamoto got that totally right with Starfox Zero! @Kirk it is looking away from the tv screen to the gamepad and back constantly that is off putting and does not work. Some gamers will be fine with this but others don't like it. Much the same as 3d, I like the 3d effects on the 3ds but others turn it off. With the success of the DS duel screen, Nintendo tried to replicate this on the Wii U but it failed. It was advertised as a way of playing games when the tv was being watched by others, but most gamers have a separate tv. Nintendo created the gamepad and then tried to find a use for it, rather than it addressing a need. @MrGawain I'm afraid things will only get worse from here. Many devs nowadays refuse to work with anything but a very specific tool, for example Unreal. While it is an excellent learning tool and a great way to produce games quickly for a low cost, it is also extremely limiting if you decide you don't want to bother with the details. Want to create a plateformer? Use the plateformer template, duh! Want to make an FPS? There's a template for that too! Of course there is always a way to tweak everything and to work on details. But it has never been as easy to mass produce cheap and unpolished software. I believe it is important that even the most basic experience should be enjoyable in a game. Simply running around and having a good time should be fun. It can start as soon as the title screen, actually. There have always been bad games and there will always be. But I definitely think the average quality has improved immensely during the 80s all the way the 2000s. I just we didn't reach a peak and are doomed to go back down now. Very interesting interview, should read the full thing later on! Also there is one aspect - which is crucial about this feeling - not mentioned, one that I have felt trough the years specially when playing a platformer on Nintendo consoles: the feeling of tightness of their d-pad (almost clickey feel) and how soft and tactile the buttons are when pressed. All this tegotae, IMO, relies on this hardware aspect. No other control has such feeling and even the classics Sonics plays pretty well when using Nintendo controller - well, at least on 3DS. Yep, Nintendo controls are often unique; uniquely horrible. Mario controls are utterly terrible. I don't get the hate for Star Fox Zero. The controls are just fine and for me they work even better than the SF64 ones after one gets used to them. Some people here most likely didn't even try the game out. @zool Well, that's a great example of one way not to use the GamePad well—needlessly having to look away to do some random action and then back again for whatever. But, there's plenty of ways to use it where it's strengths are and would be very apparent—Super Mario Make being a perfect example of using the GamePad done right. Nintendo did not design a flawed concept in the Wii U GamePad, not even close; it simply didn't utilise and realise its full potential properly. That's the GamePad's only real big flaw. There's just so much Nintendo dropped the ball on: Imagine if the GamePad actually had something like a ten hour battery life, of if you could actually play it anywhere in the house without hassle (in the bathroom, lying back in bed, etc. ), or if you could use multiple GamePads at once (imagine if for the likes of secret plays in Madden for example), or even if simple little annoyances were fixed, like not having analogue on the triggers for complete parity with the other controllers out there, and if the Wii U also launched with a few games like Super Mario Maker and Art Academy: Atelier day one, as well as amiibo stuff being available at launch too. . . . It would simply be an entirely different ball game entirely as far as I'm concerned. And there were even more issues than that Nintendo could have addressed too. The Wii U and its GamePad did not fail Nintendo or us; Nintendo failed the Wii U and its GamePad, and us, and that's the real truth here. With the exception of transforming you hold the controller the same way the whole time. The control system is very simple but allows for complexity through a combination of simple inputs. The fact the movement is entirely controlled by the two stickes it helps the Arwing feel more like a vehicle that you're pulling back on the right stick to slow down and the number of things you can do simultaneously as an extension of this. People talk about "looking away from the TV" being an issue. But the viewpoint on the gampad is simply a 1st person perspective with the cockpit outlined so you can tell exactly what direction you're going in. It's not much different than shifting the perspective from third to 1st person which many games(especialy vehicle ones do) except with the advantage that it allows you to aim at things that aren't in view on the TV screen. @Not_Soos "In before people comment about Sticker Star and Star Fox Zero, etc. etc., and how Miyamoto is too old and the detriment of Nintendo and needs to retire, yadda-yadda-yadda." The usual suspects have a habit of dragging it into the gutter. @MrGawain Yeah that whole Nintendo control thing. I can't quite put my finger on it, I first noticed it with Super Mario World, it felt really slippery at first but the way they lead you into extra moves as you go along is amazing. Zelda games have it, Metroid Prime had it in a different way. You just reach this point where you hold a control but you just don't even need to think about what your hands are doing, it's a synergy between hands and screen. @Kirk You said: Nintendo simply didn't utilise and realise the Gamepads full potential properly. You are right. Nintendo designed the gamepad on the back of the DS design and then tried to fit games to its concept. But it for most part didn't work. @zool Like I say, there's not an inherent flaw in the idea of having a GamePad, which is basically a standard controller with a touchscreen and a few other bits and bobs, but Nintendo just failed to both take advantage of it fully and quickly enough as well as show it off as effectively as it could have. And, like I also said, the Wii U also had way more issues that just this, and it's for all the reasons together that the Wii U ultimately flopped. So this is how to describe the "weight" I feel when playing characters in Nintendo games. I feel this especially in Smash Bros. When I'm DK I FEEL like the strong, but fast ape he is. When I'm Kirby I FEEL like a light but powerful puff. It's hard for me to play Bayonetta because I FEEL like the tall, spindly dame she is and that makes it difficult for me to control her. I agree with @JaxonH that Nintendo is second to none with this kind of thing. I've been playing some older games lately, mostly NES. Ninja Gaiden for the NES has such a great feel to me from the first moments of play. Shatterhand and Batman are among my favorites on the NES and I love how they feel in action. I'm impressed with Batman's feel since Sunsoft designed the jump with slight delay, but it works very well for me. Also, many beat em ups get feel right, but I've always thought Golden Axe really excelled there. Between the timing and sound effects, I can "feel" the hits. Another great feeling game is Shinobi 3.